Sonali Bendre said Hrithik is the "best babysitter in town"
On Hrithik Roshan's birthday today friends and family of the Bang Bang! star gave him their best wishes but Sonali Bendre revealed a yet unknown side of the 44-year-old actor - he's the "best babysitter in town." Hrithik Roshan was married to Sussanne Khan and they co-parent 11-year-old Hrehaan and 9-year-old Hridhaan. 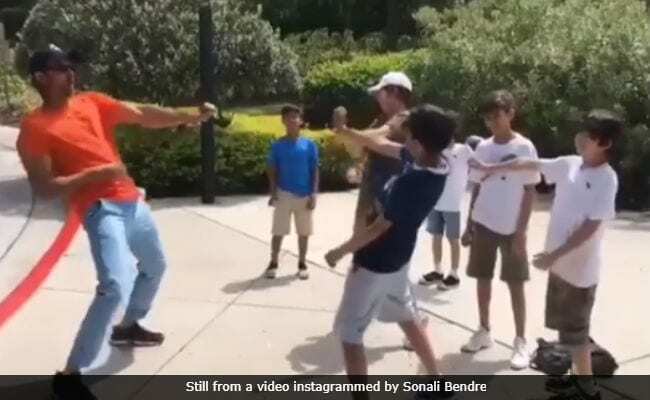 Sonali shared a video of Hrithik teaching a few dance moves to a group of children, which includes Sonali's son Ranveer, Hrehaan and Hridhaan among others. It is truly adorable. "Happy, happy birthday to the best babysitter in town and one of the nicest people I know. Wishing that this year brings you all that you hope for. Lots of love always," she captioned it. Hrithik Roshan is one of Goldie Behl's (Sonali's husband) close friends. Hrithik and his ex-wife Sussane, Sonali and Goldie often hang out together and sometimes, Akshay Kumar and Twinkle Khanna (Hrithik's neighbours) and Gayatri Joshi and Vikas Oberoi join the quartet. Sussanne's birthday post for ex-husband Hrithik was undoubtedly one of sweetest things on the Internet today, maybe even including the video above. Sussanne captioned their photo: "Forever and always you stay the sunshine in my life." Hrithik Roshan is currently busy with Super 30, a biopic on mathematician Anand Kumar. His father Rakesh Roshan also announced the tentative release date of Krrish 4 today - it is Christmas 2020. Hrithik Roshan was last seen in 2017's Kaabil, which failed at the box office.